Taipei, Jan. 10 (CNA) Labor groups in Taiwan said Wednesday that they plan to hold a referendum in a bid to overrule newly passed controversial amendments to the Labor Standards Act, saying that the new law is expected to place a heavier burden on workers. The referendum plan came after lawmakers passed the revision to the existing labor law after an intensive 18-hour review, including debate and a vote, amid protests by labor groups gathered outside the Legislative Yuan. The new revision is scheduled to take effect March 1. Chan Su-chen (詹素真), head of the Hsinchu County branch of the Taiwan Confederation of Trade Unions (TCTU), said the passage shows that the government does not pay attention to workers' rights. Under the new amendment to Taiwan's Labor Standards Act, employees can be asked to work 12 days in a row and work shifts with only eight hours of rest in between, but enterprises must get approval for that from related government agencies and also from their employees. Under the existing rules, employees cannot be asked to work for more than six days in a row and should have a rest period of at least 11 hours between shifts. The government claims that the new revision will allow flexibility for employers and employees to arrange work schedules to meet various demands from different industries, although labor groups argue that such approval will be hard to obtain. The amendment also allows for a maximum of 54 hours of overtime per month, up from the current 46 hours, but caps it at 138 hours over a three-month period. 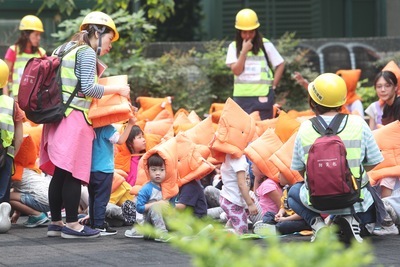 Chen Shu-lun (陳淑綸), the TCTU Taipei branch head, said the new law is expected to make workers exhausted through longer work hours and has nothing to do with flexibility. Another major change in the amendment states that compensation for a "flexible" rest day -- defined as a day off on which employees can opt to work if employers ask them to -- will be calculated based on the actual amount of time worked rather than a range. Under current rules, workers who do fewer than four hours of work on a "flexible" day off are paid for four hours, while those who work between four to eight hours are paid for eight hours, while those who work between eight to 12 hours are paid for 12 hours. The new amendment also stipulates that compensatory leave can be used as remuneration for overtime work instead of employers having to pay extra overtime pay. Chen said she is pessimistic that workers will actually be paid for their overtime, adding that the revision will make working conditions worse than ever. Supporting the trade union confederation branches in Hsinchu and Taipei, the TCTU Taoyuan branch head Wu Chia-hung (吳嘉浤) said his group will join efforts to hold a referendum on the issue. However, Lai Cheng-i (賴正鎰), chairman of the General Chamber of Commerce, one of the major business groups in Taiwan, hailed the passage of the revised labor law, saying that the business sector welcomes the flexibility provided by the amendment. The just revised Referendum Act, which took effect last week and has lowered the thresholds for plebiscites in Taiwan, allows referendums to be easier to be declared valid.